South Africa captain Faf du Plessis has been ruled out of the remainder of the tour of Sri Lanka due to a shoulder injury. Du Plessis suffered the injury during the third ODI while attempting a catch. 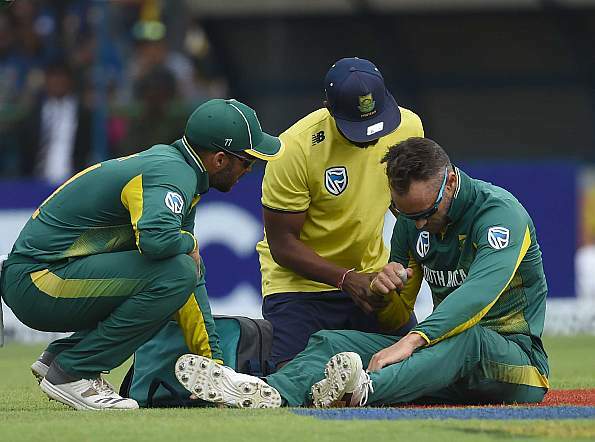 "Faf sustained an injury to one of the rotator cuff tendons in his right shoulder and will unfortunately be unavailable for the rest of the tour. He will need a rehabilitation period of up to six weeks to make a full recovery. His return date back to South Africa will be confirmed in due course," said Dr Mohammed Moosajee, South Africa's team manager. South Africa are set to name a stand-in captain from the squad and have decided not to call for replacements. The tourists have already clinched the five-match ODI series after winning the first three games and will be without the services of du Plessis for the two remaining ODIs and one-off T20I.